I'm a mom of two daughters who is an avid supporter of STEM education, especially when it comes to encouraging our girls to reach for the stars in education through science, technology, engineering and math. So, I could not be more excited to be joining together with some of my favorite fellow mother Instagrammers to host a fantastic giveaway featuring the NEWEST American Girl doll, Luciana and lots more. 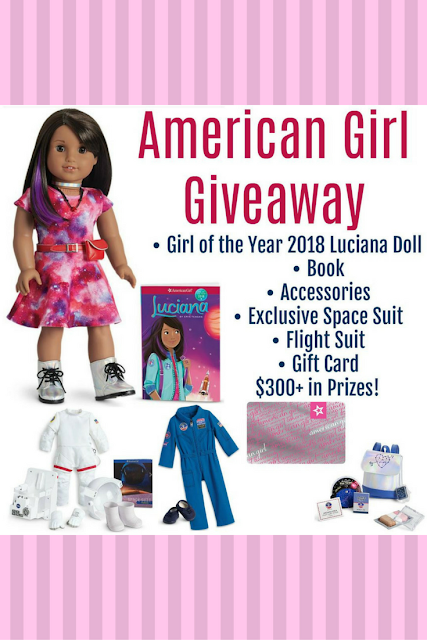 The winner gets the American Girl Luciana Doll and book, her accessories, space suit (an exclusive only available to AG members), a flight suit and a $155 American Girl giftcard. It's easy to enter. Just FOLLOW MBE on INSTAGRAM and refer to the contest directions there to be eligible to win. This giveaway is not sponsored by or affiliated with Instagram. Open to US entries only. Must be 13+ years old to enter. Giveaway ends on 1/10/18. Account must be public to win this sweepstakes. FTC Disclosure: A group of Instagrammers and I are co-hosting this giveaway and supplying the prize package. Tara at Seeing Dandy will be announcing the winner and shipping the prize. See complete FTC disclosure information that appears at the bottom of MommyBlogExpert's main page and at the bottom of every page including this one.